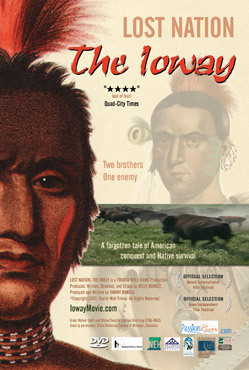 Feb. 25 — Free Screening of “Lost Nation: The Ioway” at 7 p.m. at the National Center for the Preservation of Democracy. In the twilight of Native American dominion, two Ioway leaders travel to Washington, D. C. in 1824 to meet with Superintendent of Indian Affairs, William Clark. Both sign a treaty ceding a large portion of tribal land for settlement. White Cloud sees cooperation as the only way for his peop le to survive, while Great Walker regrets the loss of land where his ancestors are buried. More territory is lost, and the Ioway people are divided, with some regarding one leader as a traitor, and the other as a patriot. After the tribe is removed, the 36 million acres they once called home is named ‘Iowa’. Then, they are forgotten. ‘Lost Nation: The Ioway’ tells the dramatic true tale of two leaders’ struggle to save their people from inevitable American conquest, and the Ioway’s current fight to reclaim and maintain their unique history and culture. Special guest TBA. The film series is held at the National Center for Preservation of Democracy located at 111 North Central Avenue, between First Street and Central Avenue, in Little Tokyo. The NCPD can be reached via train, bus, or parking in the area. Screenings will begin at 7 p.m., and it is advisable to arrive at least 15-20 minutes prior for seating. Each film will include a raffle at the end of the screening. Doors open at 6:30 p.m.